Many cookbooks come from a family’s kitchen, a reflection of the food they cook and eat together. It shows that food is more than just fuel, that it’s a means of drawing people together, something that knits through the fabric of daily life. , has that sense of family and familiarity, that tangible feeling of warmth and heritage. It’s a collection of Syrian food from Salloum’s family, most recipes with a story attached, some that have translated into dishes served in Salloum’s restaurant. Middle Eastern and Levantine food tends to have a certain homogeneity – there’s a broadly pan-Arab style that’s present across the countries of the Arabian peninsula, the Persian region and into the eastern Mediterranean and beyond. There are differences, of course, different preferences from country to country, but the staples of things like lamb or mutton, olives, lemons, bulghar wheat, flat breads and the like persist across the region. Syrian food has a strong Turkish influence, and is close in style to other Levantine cuisines, such as Lebanese and Israeli. Salloum writes with affection about her country’s food, and spins some of the dishes with her experience of serving them in her restaurant. There’s an infectious warmth in the way Salloum describes her food, and the reasons why each dish is important to her, and it’s this warmth that makes this book a success. Yes, many of the recipes are fairly standard Middle Eastern/Eastern Mediterranean fare, but many others have been developed in Salloum’s style and are more than their origins … the same, but different. My biggest criticism would be that I found the cursive script used for the title of each recipe unreadable in many cases, and I had to resort to the index to work out what some dishes were actually called. 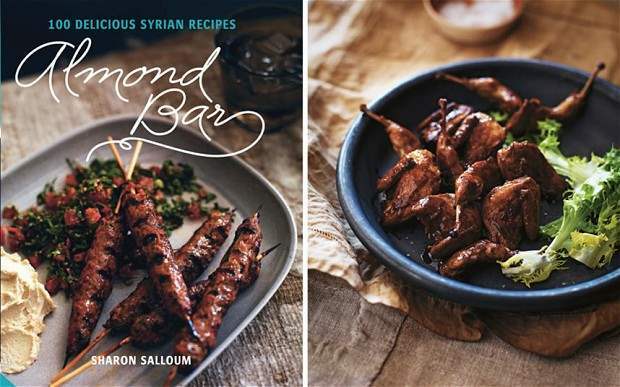 It feels slightly odd to be writing about a book of Syrian food as Syria tears itself apart day by day, but this is what I find myself doing, and Salloum’s is a good book, a book full of heart and soul, as I suspect Syria itself is, past the violence and the bloodshed. Perhaps one day Syria will be at peace, and perhaps once again, its people will cook food like this and eat it as a family.